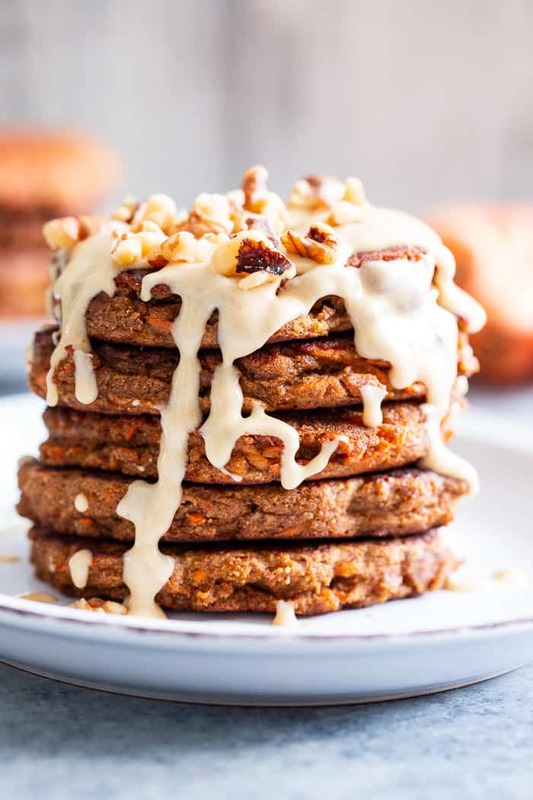 These fluffy, sweet spiced carrot cake pancakes have a dairy-free drizzle that tastes just like a cream cheese icing! They’re made with coconut flour and sweetened with coconut sugar for a healthier take on a Spring breakfast treat. Gluten-free, dairy-free, refined sugar free, and paleo friendly. It’s officially Spring and that means all things carrot cake are in season! 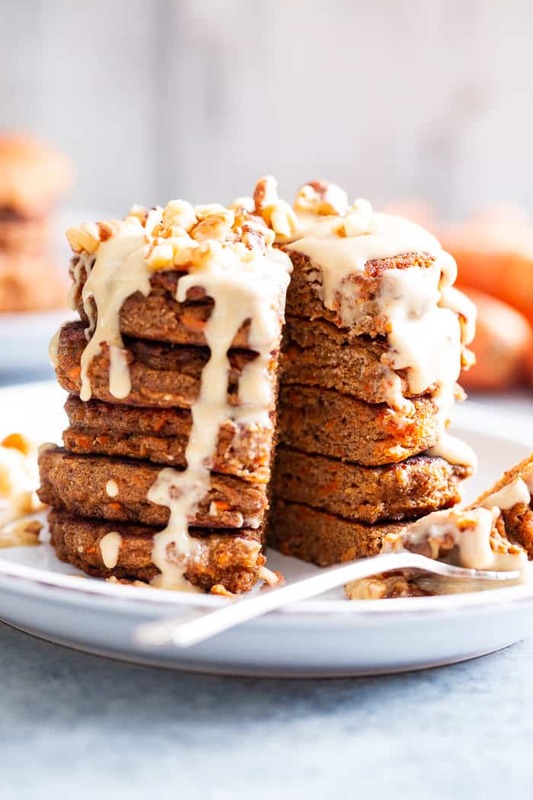 Since I already have this epic carrot layer cake, carrot cake cupcakes, and a carrot coffee cake, pancakes just seemed like the perfect next step. I admit that I’m not the biggest pancakes person in general. When I do make pancakes for myself, I like to make them “special” and “fun” and these carrot cake ones totally fit the bill. 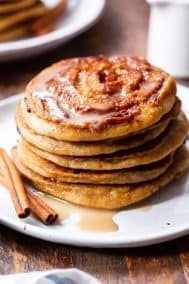 They’re sweetly spiced, moist and fluffy, and have a drizzle that tastes just like cream cheese frosting – I was sold with the first drizzle! 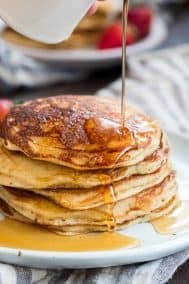 I based these pancakes loosely off of my “buttermilk” pancakes, which means they’re made with coconut and tapioca flour, and, without the drizzle, nut free. 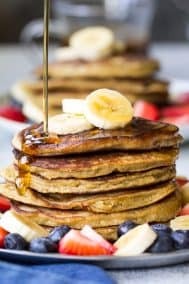 I tend to go for coconut flour over almond flour when it comes to pancakes – which is unusual because I gravitate toward almond flour for basically everything else. First, pancakes don’t need to rise the way muffins/cakes do, which makes coconut flour an easier option. Second, coconut flour pancake batter is so thick, that I feel like I have more control over the shape of the pancakes, since you basically have to spread them into shape yourself! I always use tapioca or arrowroot in the mix as well, since it gives them the “fluff” factor that’s necessary when it comes to pancakes. 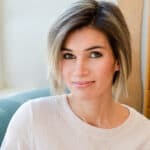 I cook them on a lower heat setting than you typically would for pancakes, and they’re easy to flip – a big bonus for me. Since for this version you’ll be adding lots of shredded carrots, the pancakes aren’t perfectly round. But, any oddly shaped pancakes are easily made up for with a generous drizzle of the cream cheese icing! I also decided to add some chopped walnuts on top of the drizzle and they were totally perfect. Side note – I made the icing in just about one minute in my Ninja blender – barely any cleanup and you don’t even need to soak the cashews! The Ninja is my new favorite blender for small-batches of icing and cashew cheese – it works so much better than any larger blender or food processor. I hope you’re ready for a fun SPRING themed breakfast treat! 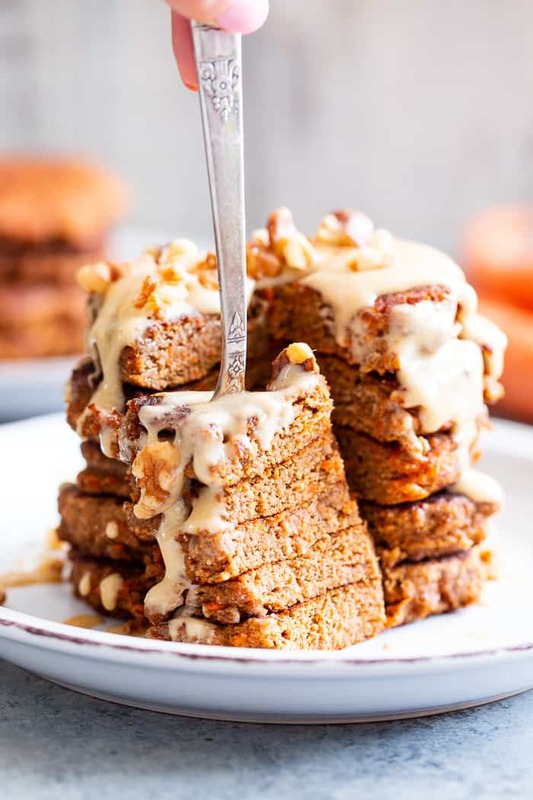 Get those carrots shredded and grab a nice big non-stick skillet because it’s time to make these carrot cake pancakes – let’s go! 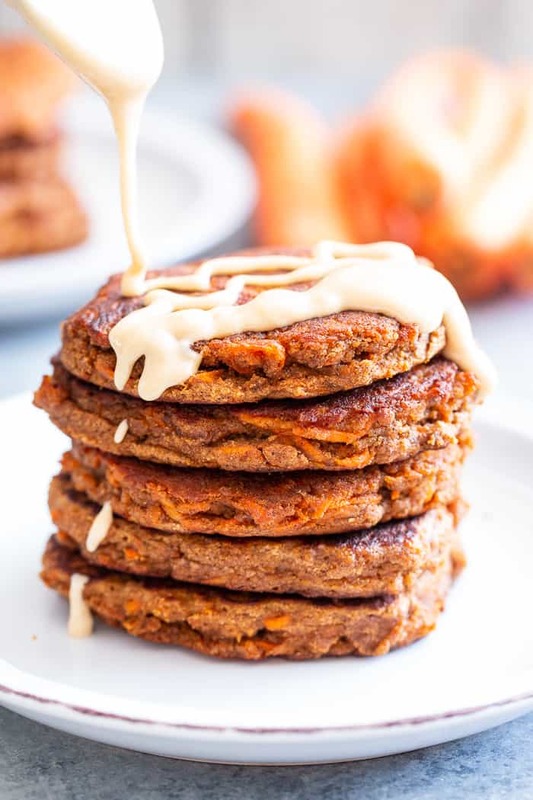 These fluffy, sweet spiced carrot cake pancakes have a dairy-free drizzle that tastes just like a cream cheese icing! They're made with coconut flour and sweetened with coconut sugar for a healthier take on a Spring breakfast treat. 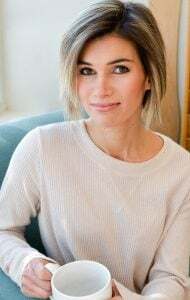 Gluten-free, dairy-free, refined sugar free, and paleo friendly. In a small blender or food processor (I used a Ninja) blend all ingredients until a smooth, drizzly texture forms. Set aside or store in the refrigerator until ready to use. It will thicken when chilled so feel free to warm it slightly before serving. In a mixing bowl, combine the coconut flour, tapioca flour, baking powder*, sea salt, and spices. In a separate bowl whisk together the eggs, coconut milk/lemon juice mixture, melted ghee/coconut oil, coconut sugar, and vanilla until well combined. Slowly stir dry ingredients into wet until no flour spots show (coconut flour can be stubborn, make sure it’s mixed in.) Lastly, fold in the shredded carrots. Batter will be very thick due to the coconut flour. 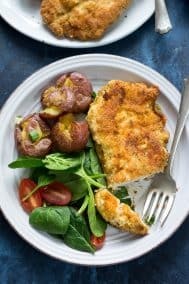 Heat a nonstick skillet or griddle over med/low heat and coat with coconut oil. Gently spread about 1/4 cup pancake batter into a circular shape beginning in the center. 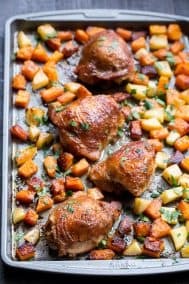 Once dry around the edges and bubbles form, flip and continue to cook until golden brown, on medium low heat, adjusting heat to avoid burning the outside while still cooking the inside. Cook in batches, adjusting heat and adding coconut oil or ghee as needed. Serve right away, topped with the cream cheese drizzle and chopped walnuts if desired. Enjoy! *Note: to make paleo (corn free) baking powder, mix 1 tsp baking soda with 2 tsp cream of tartar. For this recipe, you’ll need 1 tsp total of this mixture. Want More Paleo Pancake Recipes? Try One of These! 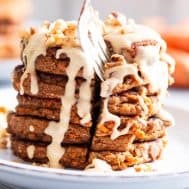 I’ve been craving all things carrot cake and these pancakes look amazing! I need to make these this weekend! Curious what would happen if you left out the Tapioca starch and coconut sugar? I believe leaving out the tapioca would be fine – a little less fluffy and more dense. The coconut sugar definitely sweetens it up so they’ll have less flavor without, but the recipe would still work. 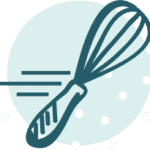 Can you link the ninja blender you use for the small batche of icing you made. The vitamix is just to big to mix that small amount of nuts? I’m actually going to try this tonight with macadamia nuts!! I read on the internet somewhere that you can sub macadamias for cashews. I’ll tell you how it goes – I’m deathly allergic to cashews, which is so sad because most Paleo “cream cheese” recipes call for cashews. 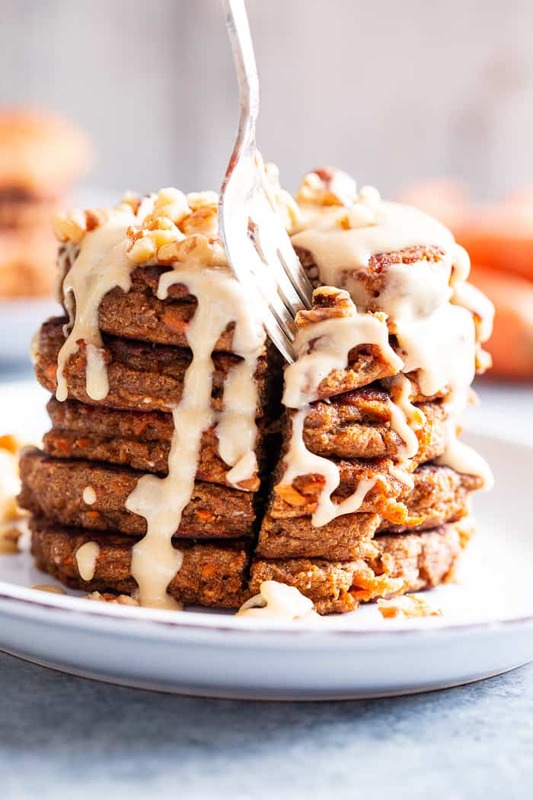 I love the idea of carrot cake pancakes! 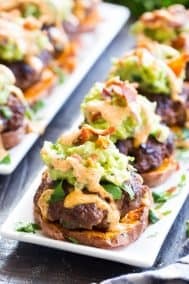 Looks so delicious and perfect for weekend brunch! These looks so good! Love that you put nutrition info but can you tell me the serving size per the nutrition info? Thanks! Could you make these as waffles? 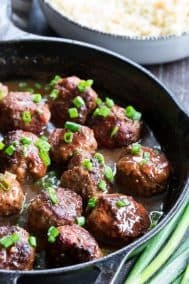 This recipe sounded so amazing, I couldn’t wait to try. My “cream cheese” drizzle didn’t turn out but whatever I blended up had great flavor! I have found that working with coconut flour/sugar can be very temperamental. My pancakes seemed a little dry but I will definitely try this recipe again!!! 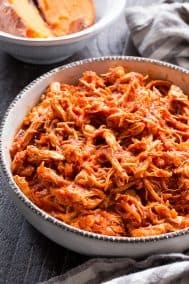 nice recipe thank you for shearing keep it up please shear more & more recipes.